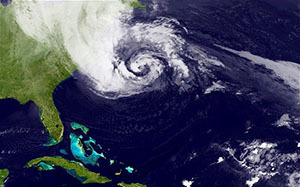 As Hurricane Sandy inches ever closer to the Eastern Seaboard, Chabad-Lubavitch Rabbi Eli and Beila Goodman are among the millions of people, stretching from Boston to Washington, D.C., preparing for the arrival of what meteorologists say could be one of the biggest storms on record. Based in Long Beach, N.Y., they spent Sunday closely following news of the tropical system’s large water surge and high winds, as well as the damage said to be on the way. With a mandatory evacuation order issued for their area, they’ve been working quickly to sandbag both their ground-floor apartment and their synagogue, as well as to help others doing the same. The rabbi, who directs Chabad of the Beaches and serves as educational director of the local Bach Jewish Center, said they’re stocked with water and flashlights, and will stand at the ready to assist with whatever is needed. They’ll be relocating several blocks from the water to wait out the surf and wind. “I have a few people ready and on call to help,” stated Goodman, who also spent most of the day reaching out to locals to make sure everyone had plans for the storm.